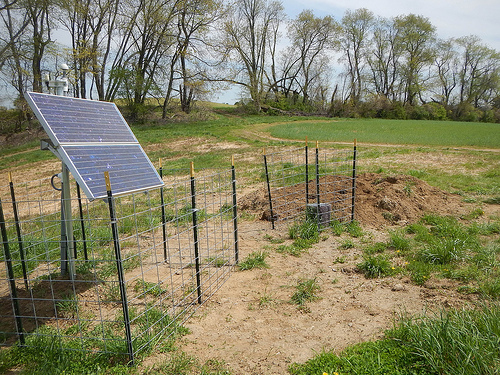 EarthScope is seeking local landowners and schools willing to host Transportable Array seismic stations on their property for 18 to 24 months. These transportable seismic stations will record data that will allow us to produce images of the Earth's interior and gain new insights into the earthquake process. Interested in Hosting a Station? Respect the property and privacy of landowners throughout the experiment, notifying the landowner whenever access is required. Be responsible for the security and operation of the station. Assume liability if the equipment is damaged or stolen, remain responsible for any damage done to the landowner's property, and hold the landowner harmless for any loss or injury. Remove the equipment completely after the experiment. Provide the landowner with updates about the project and sample recordings from their station. Transportable Array seismic stations are being placed across the United States in a uniform grid of 70 km (~ 42 miles). Because there aren't enough seismometers to cover the entire United States at one time, the first 400 stations were placed in the westernmost United States and are now leapfrogging ("rolling") eastward to cover the entire country. For more information go to the When & Where page. A completed transportable seismic station. Transportable seismic stations have a low profile--there is no noise or motion associated with the equipment. To reduce interference from surface vibrations and to protect the equipment, the seismometer and associated electronics are buried 6 feet below the ground inside a 42-inch diameter tank. Power is supplied by a solar panel mounted on a pole about 20 feet from the tank, with the cables buried inside a conduit. Data are transmitted to the EarthScope data processing center via cellular, broadband, or satellite communication systems. When satellite systems are used, the 3-foot dish and an enclosure with electronics are located near a source of AC power linked by radio to the seismic station. The AC power required for the satellite dish is 25 watts or 220 kWh each year (about $40 per year). In areas with livestock, a fence can be erected for protection. The equipment can also be painted to blend in with the surroundings. Installation of an EarthScope transportable seismic station usually takes two to three days. On the first day, a backhoe digs a hole 4 feet wide and 7 feet deep. A plastic tank is placed in the hole and cement is poured into the bottom to make a sealed container for the equipment. About a month later engineers install the seismograph electronics, sensor, and communications equipment and this takes about one day. An extra day is occasionally required for testing and reconditioning the landscape. The buried equipment is heavily insulated and the tank is often completely covered with soil or rocks to keep the temperature stable. The seismic stations are temporary, remaining in place for about two years, and are then reused at another site. The equipment operates continuously and routine maintenance is performed remotely. If the equipment malfunctions, it is detected at the data processing center and a service trip may be necessary to correct the problem. Disassembling the seismic station takes one day. EarthScope removes all the equipment, cuts the plastic tank at the level of concrete (usually 6 feet below grade), removes the tube, and fills in the hole. If requested, the entire tank and concrete can be removed. If you are interested in hosting a station on your property, look at the generalized grid on the When & Where page to see when the Transportable Array will be in your area. Then go to Suggest a Site to determine if your property is close to a potential station site and to submit your site details. Site locations are not firm, and will depend on site conditions, suitability, permitting, and other variables. Regional networks may permanently adopt some stations.